The bell shown in the accompanying diagram is known as the continuously ringing type, and has quite a field of usefulness in connection with burglar alarms, door-bell signals, telephone signals, etc. The operation of the bell proper is identical with that of the ordinary vibrating bell and, in addition, there is a circuit controlled by the armature of the bell, which is normally open, but becomes closed as soon as the armature is drawn over. 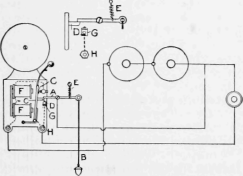 The closing of this circuit by the operation of the armature amounts to keeping the push button in the bell circuit depressed, and the bell will continue to ring until the latch A is restored by pulling the cord B. Any ordinary vibrating bell may be converted into a continuously ringing bell as follows: In the armature, C, mount a short metal pin, D, and round off its under side slightly. A latch, A, should now be constructed similar to the one shown in the sketch and mounted in such a position that its left end will rest on the outer end of the pin D when the armature, C, of the bell is in its extreme outer position. The length of the latch should be such that its left end will drop off the end of the pin D, due to the action of the spring E, when the armature C is drawn over by the electromagnets F, thus allowing it to come into contact with a spring G, which is electrically connected to the terminal of the bell marked H. The latch A is connected to one side of the line, as shown in the sketch, so as to include the bell winding and battery in a local circuit that is formed by the latch coming in contact with the spring G. The end of the latch should not interfere with the free operation of the armature when it is resting on the spring G. A cord, B, attached to the outer end of the latch, is used in restoring it, and at the same time stopping the bell from ringing. The tension in the spring E should be so adjusted that the operation of the latch is sure and firm, yet not too stiff.